Although Beijing, China has struggled in previous years to adopt strong transport demand management (TDM) strategies, the city is now looking to expand its TDM policies to combat growing car ownership. Photo by Alan Sheffield/Flickr. A century of car-centric urban development has left our cities polluted, congested and searching for sustainable solutions. Transport Demand Management (TDM) strategies can provide these solutions by combining public policy and private sector innovation to reverse over-reliance on private cars. The Moving Beyond Cars series—exclusive to TheCityFix and WRI Insights—offers a global tour of TDM solutions in Brazil, China, India and Mexico, providing lessons in how cities can curb car culture to make sustainable transport a reality. As China’s GDP has grown, so has the number of cars on its roads. From 2008 to 2010, the country’s vehicle ownership almost doubled, from 38 vehicles to 58 per 1,000 people, and is set to hit 269 vehicles by 2030. This growth in car ownership not only means that the auto industry and infrastructure investments will continue booming, it also means more air pollution, energy consumption and traffic crashes. Yet at the same time, some Chinese cities are starting to see the error of a car-centric world. They’re pursuing transport demand management (TDM) strategies designed to reduce private vehicle travel and create safer, more livable cities. Beijing and Shanghai are some of the earliest adopters of TDM in China. Their different results and approaches shed light on how other cities can be successful with TDM. 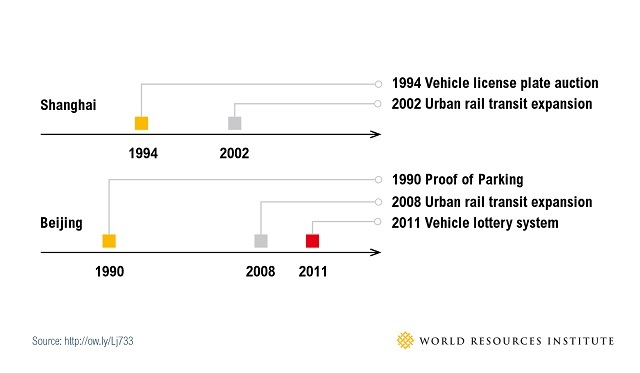 In 2004, Beijing and Shanghai both had about 2 million vehicles. By 2010, Beijing’s car ownership had skyrocketed to 5 million, whereas Shanghai’s grew to only 3.5 million. So what happened? 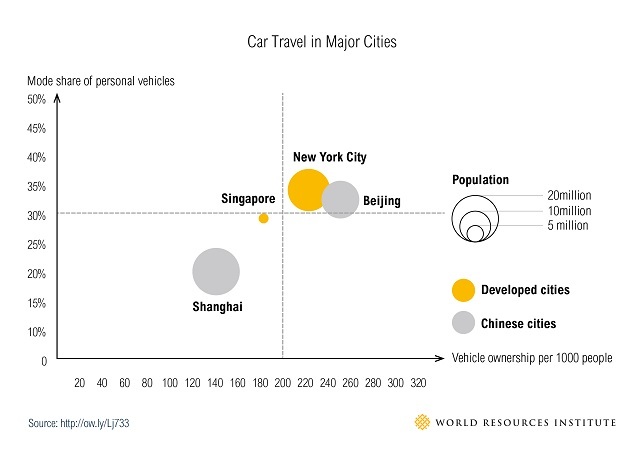 While Beijing is home to about the same number of cars as New York City, Shanghai has a smaller mode share of personal vehicles and a lower rate of ownership. Graphic by WRI China. While Beijing was early to require proof of parking, this single measure has not been sufficient at curbing traffic congestion. 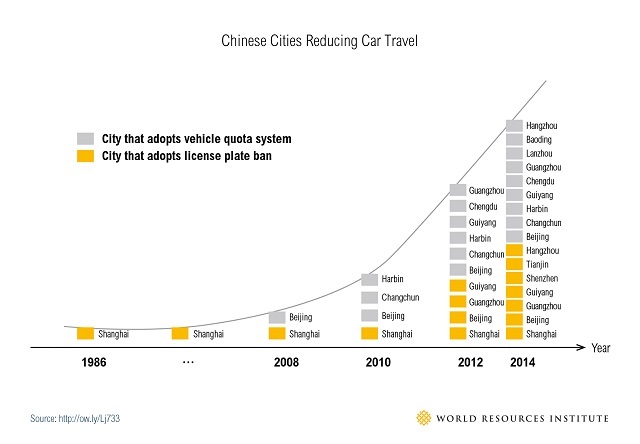 Other policies—like Shanghai’s license plate auction—have proven more effective over time. Graphic by WRI China. Shanghai was an early adopter of license auctioning, an approach pioneered in Singapore in which residents bid to receive one of a limited number of license plates. Shanghai put the policy in place in 1994, before motorization had really picked up. 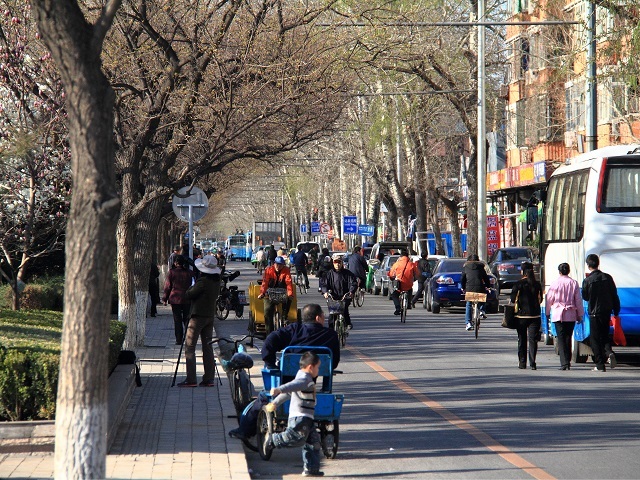 Beijing, on the other hand, did not implement its own vehicle quota system until 2011 as a reactive response to the 5 million vehicles already choking its streets. Shanghai shows that it’s important to act quickly and calculate the right timing to implementing vehicle ownership restrictions. Lesson 2: pricing is both equitable and profitable. Shanghai’s vehicle quota is allocated through auctions, which not only slows down vehicle growth, but also raises revenues for transit expansion. In contrast, Beijing adopted what it deemed a more equitable lottery system, randomly awarding licenses to applicants. This has backfired, though, as the system not only misses the opportunity to raise funds for public transit, but also spawned black markets for winning bidders to capitalize on their free licenses. Lesson 3: quick fixes are not enough. Before switching to a vehicle quota policy in 2011, Beijing adopted “proof-of-parking,” a policy that requires residents to obtain parking certificates before purchasing a car. Although this policy has been successful in Tokyo, the high costs of verification and the lack of enforcement meant fake certificates were easy to come by in China. The policy was eventually abandoned. Other Chinese cities have similar stories. These regulatory policies often seem easy to implement and likely to produce quick wins, but have limited effect considering the scale of China’s motorization challenge. TDM cannot work in isolation. In both Beijing and Shanghai, the introduction of TDM policies came at the same time as expanded and improved transit services so that new alternatives are provided when driving is not an attractive option. Further, complementary measures, like investing in public transit, dense and mixed use development around transit stations, and walking and cycling improvements, can complement TDM and maximize its effectiveness. Despite pushback from the auto industry, political will is building to get driving under control. Beyond Beijing and Shanghai, Shenzhen adopted a vehicle quota system in 2014 that limits new cars sold in the city. Even more cities now restrict which vehicles can travel on certain days of the week based on license plate numbers. And given China’s top-down institutional structure, implementing innovative and experimental TDM strategies can be easier and more flexible than doing so in other countries. Shanghai was one of the first cities in China to regulate road use based on license plates. Later, Beijing and other cities adopted vehicle quote systems. Graphic by WRI China. And there’s hope that even those cities still seeing an unflinching increase in car ownership will eventually get their car habit under control. Beijing, for example, learned quickly, and is now embarking on a new path. The city is currently looking to expand its TDM options to include congestion pricing and has proactively engaged the public in policymaking and implementation. The city is also showing leadership by limiting vehicles purchased by government institutions in an effort to combat the cultural preference for car ownership. Most importantly, the city has come to understand that a sustainable city is a place for people, not cars. Such lessons can pave the way for a sustainable urban future in China.